Farmers who grow corn may not realize that they can make use of the corn they grow instead of selling it to local merchants. They can add value to their product by making cornmeal soap. The family can use this at home, or they can sell it to their neighbors and earn some money. 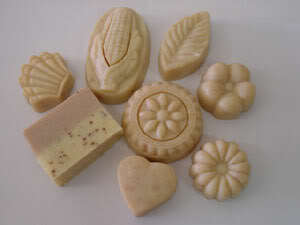 Cornmeal soap is made from high-quality natural ingredients, including various kinds of vegetable oil, cornmeal and sesame seed. For this reason, this kind of handmade soap is very mild on the skin. Cornmeal is added to the recipe to improve the quality of the soap. Cornmeal soap helps to unclog the pores and remove excess oil. The rough granules of cornmeal scrub dirt and oil from the skin. Farmers can make their own cornmeal using the following recipe. 1. Pour the lye into the water and stir well. Set aside until the temperature falls to 42oC. 2. Mix the coconut oil, olive oil and palm oil together in an enamel pot. Heat the oils to a temperature of 42oC. 3. Slowly pour the lye solution into the oil mixture and stir well. If the temperature of the mixture falls, heat the mixture up to 42oC again. 4. Stir the mixture for up to one hour until it becomes ‘trace’, (i.e. clear). Then add the glycerin, Vitamin E, cornmeal and sesame seed. Stir for five minutes, then add the fragrance. 5. Pour the soap into molds. Leave for at least six hours or overnight. 6. Remove the soap from the molds, and cure in a shed for one month. This is to make sure there is no residual effect from the caustic lye. * The corn should be ground to a fine powder, otherwise it may irritate the skin. * The sesame seed should be cut into small pieces rather than crushed. This is because crushing squeezes the oil out of the seed, and the ground sesame clumps together. * You should wear an apron, rubber gloves, and safety goggles to protect yourself from the caustic lye solution. * Avoid using utensils made of aluminium or other metals, because they react with the caustic lye solution. An earthenware pot should be used to treat the mixture. * After the lye has been poured into the water, stir it immediately. Otherwise, the lye will clump together and be difficult to dissolve. * When you pour the caustic lye solution into the oil mixture, make sure that the temperature of the lye and the temperature of the oil are the same. * Protect the surface of the table you are using with old newspaper. * The molds should be made of plastic, because it is easier to get the soap out. * If it is difficult to get the soap out of the molds, put the molds into a freezer for three or four hours. You can then remove the soap easily. * This recipe yields nine bars of soap, each weighing 60 g. The production cost is approximately US$0.25 per bar. This cost is calculated from the ingredients only, and does not include the cost of kitchen utensils. The recipe can be doubled or tripled, depending on the amount required. * After the bars have been cured for one month, check the pH of the soap with litmus paper before it is used. The soap should have a pH of 8-10. This method is not difficult to follow. It may be awkward at first, but when you get used to it, it becomes quite enjoyable. People often enjoy experimenting with the recipe. In Thailand, many groups of farmers from many provinces have become interested in making cornmeal soap. They join training courses, or visit the Nakhon Sawan Field Crop Research Center. Some ask for leaflets in Thai, which are distributed free. One group is making the soap as part of the “One Village, One Product” program, and is making a good income from it.